Distributor: Currently released as a Funded Kickstarter Project for international customers. Various other releases available. 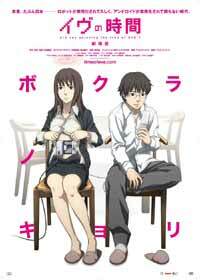 The TV series whom this movie is based on is available on Crunchyroll. Also Recommended: Hal, Chobits, Yokohama Shopping Log. Notes: Based on the orignal ONA, with some new footage added and the whole thing pieced together into a full movie, with a new ending theme by Yuki Kajiura, performed by Kalafina. In the future, sentinent androids are a part of human life. Many of them are so human-like that they're required by law to have an information halo activated at all times for identification purposes. Worrying about a mysterious entry in the family android\'s data log, Rikuo finds a relatively well hidden cafe known as Time of Eve, whose one main rule is "no discrimination". Eventually, Rikuo also figures out that one of the underlying rules is that androids need to deactivate their information halo, effectively shattering the barriers between humans and androids. A couple of years ago, I actually set out and watched half of the original series. While I found the series quite appealing, I never really got around to watching the rest, and even now that I've watched the movie, I'm still not sure why. Time of Eve also isn't the first show I ever watched that deals with the concept of artificial humanoids or the relationship between them and regular humans. I mentioned in my Chobits review a movie that had been the first to make me ponder about this, but even Chobits itself -- the manga in particular -- also went into some of the aspects of a man/machine relationship. While Chobits might be a vastly more pandering example of the genre, it shares a lot of common traits with Time of Eve. It's a lot more focused than Chobits too, dismissing CLAMP's trademark shoujo traits and Chobits's own brand of male wish fulfillment and going straight to the core of the issue. One very noticeable aspect to Time of Eve is that it's completely different in tone compared to just about any other movie or series about the subject that I've seen; it's... well, if not pessimistic, at least blatantly pragmatic about it. The core problem for the characters in Time of Eve is that getting too friendly with your "tools" is heavily frowned upon, and whenever the characters in the show aren't in Time of Eve -- the bar, that is -- they're often subjected to political propaganda from the Ethics Committee, blaring off every TV screen both inside and outside, more or less to the point where Rikuo's sister comments on its frequency. "Don't become a robofreak" it often warns, and the results are obvious; most owners treat their android servants with anything from indifference to outright hostility. Another, more sinister effect of this is that humans -- high schoolers in particular -- are quick to jump at each other for any perceived showing of affection towards their droids. It gives the show a disconcerting undertone of facism that may have played a role in why I didn't continue with the last half of the original show, despite its quality. Which is why Time of Eve (again, the bar) is a safe haven from all of this, and its effects are quite noticeable even on the robots. It's downright staggering how different they act in the bar compared to outside. Which is understandable, what with all the android hostility on display in the outside world. In a sense, it's a racism debate all over again, and Time of Eve doesn't leave much in the way of ambiguity about what side it wants you to take. Not that I disagree, but I'm not always fond of being catered to opinionwise either. I guess you could say that this was the other influence that kept me from watching the last three episodes on Crunchy. But, despite said catering, after having watched the movie, I have to say it's a really wonderful title altogether. Even though I feel like I'm being lectured AND having my back scratched at the same time, it's enjoyable to see people stay at the cafe and learning and growing as people, or just seeing the androids take on completely different expressions compared to the near stone-faced behavior they always have when walking outside, or working in the family home. It was also encouraging to see a character like Rina -- a very voluptuous woman wearing a dress that might as well have been painted directly on her body -- being treated like a proper character in the story, including her problems and her relationship with another male regular at the Time of Eve. It's portrayed as quite flirtatious, but also very vulnerable given both their situations. I can only imagine how a woman like that might be looked upon in our own world based on her appearance alone, but Time of Eve doesn't mind, and neither should you. Not that the show doesn't allow for some levity despite its seriousness. One of the visitors of Time of Eve is an old, seemingly abandoned robot that certainly doesn't resemble a human being, but thinks of itself as one anyway. It's built like a cartoonish version of a Terminator robot, carries itself like a stereotypical butler and, due to its near broken status, spews a lot of smoke and flails its limb around with a complete lack of grace, scaring the crap out of our two male leads. The story does eventually lead to a somewhat tragic resolution that adds to the complexity of its robotic residents, but the humorous aspects to the show are still appreciated, as it turns the show to less of a depressing dirge and more of a kind of "anything can happen". Visually speaking, Time of Eve has a rather crude quality to it. Character designs are actually pretty good, but the animation varies a bit. It's oddly stiff at times, particularly during quick character movement. On the other side, the characters in the show are often wonderfully expressive -- easily the show's biggest strength -- so it's a matter of perspective in the end, and the thing to remember is that the original TV series was a bit of an indie project in itself. The backgrounds are both the show's neatest aspect as well as the more eye-hurtingly glaring one. It's clear that most of the love of the show has gone into Time of Eve -- again, the cafe -- in all its warm, brown-ish glory. The outside world, on the other hand, is a sterile, sharp enviroment filled with harsh, white light and the aforementioned TV screens admonishing people for getting too cozy with their "merchandise". Most of it is probably rendered in CG, because the camera angle will often pan and rotate around places you visit. It's most likely a deliberate choice of an art style, and when it comes down to it, the overall quality still puts most TV shows to shame. The dub is really well done too, so people who want to pay attention to the show without having to keep their gaze at the bottom half of the screen will not have anything to worry about. Nitpicks aside; I knew I would resume this show some time or another. Despite all this negativity, all this harsh, glaring sterility, the movie has a faint, optimistic glow that slowly permeates everything it touches and does, all the way to Sammy's faint smile near the end. With its somewhat open end and the wonderful ending theme by Kalafina, it puts me in a weird melancholy mood and makes me want for more. Recommended Audience: There is not a whole lot of onscreen violence going on, but the movie (and by extent the original series) makes it quite clear the level of abuse some of the androids has to endure. There's also Rina, the woman who puts her sexuality on full display, yet that aspect of the show is treated with an odd sense of maturity, and -- dare I say it -- respect. Version(s) Viewed: Region free kickstarter funded Bluray, bilingual. Time of Eve: The Movie © 2010 Directions Inc., Studio Rikka.